In this view of the jejunum, the mucosa is at the top and the submucosa is at the bottom. Individual smooth muscle fibers, comprising the muscularis mucosae, define the boundary between mucosa and submucosa. Crypts are a prominent feature in the mucosa. One crypt is outlined in green. The lumen is visible at the center of this crypt. Pale "bubbles" in the upper portion of the crypts are mucous droplets in goblet cells. 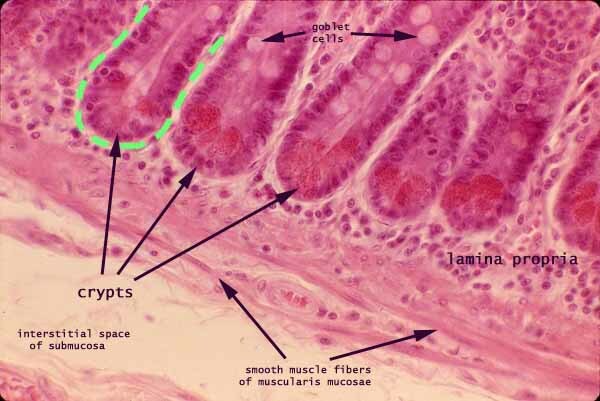 The connective tissue between and beneath he crypts is lamina propria.